Electronically Monitor the Pool and Outdoor Area . . . automatically!!! Scroll down to browse through information on a Floating Monitor System, for pools and outdoor/indoor areas. The Website Store Directory contains an alphabetized listing of all products for sale. We don't just sell products. We help you make a better-informed choice, by providing all the information, you might require. Need ordering help? Scroll down the page, for the Order Desk Telephone Help Number. All items ordered will end up in the same shopping cart, no matter which page of this website, the items are located. All Major Credit Cards and PayPal are accepted. Order one today. cFloat is an advanced Pool and Outdoor/Indoor Monitoring System, that collects key information from pools and the surrounding environment. Deep integration of water chemistry, safety, aquatic activities, technology and intelligent software work seamlessly, to provide real-time updates on a variety of pool and environmental parameters. Data is stored in the cloud and accessible on a smartphone, tablet, laptop or smartwatch. The cFloat app is a modern and easy to use application that displays the data collected by the cFloat system. The cFloat app is compatible with iOS and Android. A web version is also available. With the cFloat App, notifications and alerts can be displayed on the user’s devices. The manufacturer will provide a telephone or email session, to assist the setup, if you should require any help. Go to the Google Play or App Store to download an APP, that enables you to monitor all of the activities and features. described above. Home: The Gateway takes indoor measurements. It monitors the air temperature, humidity and air pressure, this data will help the user maintain a comfortable temperature inside the home and assist in saving energy and money. Health: The buoy measures ultraviolet (UV) radiation and alerts the user, when it is unhealthy to be outdoors. In addition, 1t monitors pH and ORP (Chlorine) levels in the pool, to help the user manage the water quality. The Gateway monitors indoor air quality, to assist the user in preserving a healthy and safe environment. Fun: cFloat puts the fun in functionality by measuring the size of cannonballs and the quality of dives. It helps with aquatic training and performance. 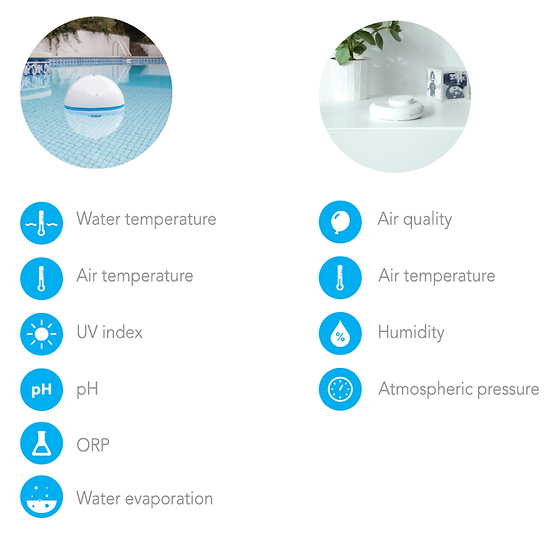 Buoy Gateway ● The floating buoy measures the following parameters: Water Temperature, Air Temperature, Ultraviolet (UV) Index, pH, Chlorine level measured by ORP, Water Evaporation and measures the size and quality of such activities as diving and cannonballs. ● The Gateway device assesses the Air Quality, Air Temperature, Humidity and Atmospheric Pressure. ● The Gateway device features an inductive charger, to recharge the buoy. Simply, place the buoy on the Gateway. ● Buoy size: 6.5" x 6.5" x 8.4"
● Gateway size: 5.3" x 5.3" x 1.2"
● Shipping size: 13" x 8" x 8"
The Shock-Guard 24/7 ™ Volt Detector and Alarm System warns of electrical hazards and creates peace of mind and a safer aquatic environment. Shock-Guard 24/7 ™ monitors the pool or spa water, for the presence of electricity, 24 hours a day. If as little as 1.7 volts of electric current is detected, in the pool or spa water, it sounds an alarm, using its built-in buzzer, warning of the potential danger. 1-2 weeks may be required, before shipping.